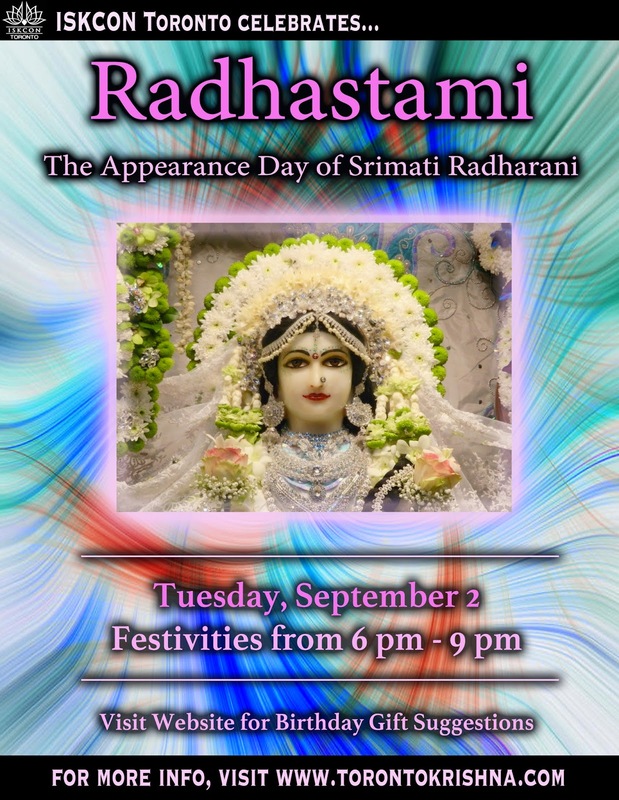 The Hare Krishna Temple warmly invites you and your family to join us on Tuesday, September 2nd for Radhastami celebrations - celebrating the appearance of Srimati Radharani! Festivities will commence at 6:00pm, stay tuned for more details. As an annual tradition, the highlight of the evening will be when we open gifts for Srimati Radharani that have been brought by the assembled devotees. A humble request is that all gift items be new as gifts will be placed on the altar and will be unwrapped and shown to the Deities during the program. We will have some gifts available for purchase on Sunday, August 30th as well as on Radhastami day. Of course donations of any kind are always warmly accepted! For festival sponsorship information contact Satyabhama devi dasi.